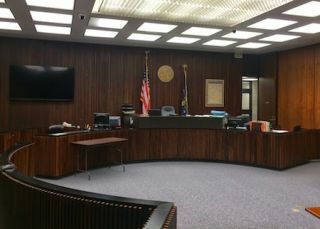 When jurors would arrive for duty at the courthouse of Lake County, IN, a few years ago, they were often taken aback by the outdated facilities, most of which had remained unchanged since its opening in the 1970s. Things have changed tremendously at Lake County’s courthouse, which serves the second most populous county in the state with over half a million residents. Located along the shores of Lake Michigan and bordering Illinois and the Chicago metropolitan area, the Lake County court system has been receiving a technological makeover befitting of its stature. One of the four criminal courtrooms in the Lake County Courthouse, with 80-inch wall TV and a host of technological appointments. All four criminal courtrooms in the building are now decked out with technology, each with an 80-inch wall-mounted flat-panel, Symetrix SymNet Edge audio systems, Crestron touchpanels on the judge’s and court reporters’ desks, and AppleTV units on the defense and prosecution attorneys’ desks, so they can share evidence from their iPads or laptops on the wall television. It all began in early 2013, when Judge Stefaniak asked Price to look into a grant from the Indiana State Court that dealt specifically with technology. Within months, the operation was underway. For an integrator, Price sought out Rick Cannon and his company, Technology Consultants Group, or TCG, which had experience with courtroom integrations. For the audio integration, Cannon chose the Symetrix SymNet Edge Dante-scalable DSP, outfitted with an acoustic echo cancellation (AEC) card and its associated processing capabilities. A cost-effective SymNet xOut 12-output expander connects to the SymNet Edge frame via Dante and provides the additional outputs needed for the courtroom’s many necessities, and Dante scalability ensures that future changes and additions will be easy to accommodate. Other equipment used includes an Elmo system to look at evidence on the wall TV, a WyreStorm HDMI switcher, Antex Electronics DMX-8 recording mixer for courtroom recording archiving, and Samsung flat-panel on the desks of the judge, prosecution, and defense attorneys. In the future, the court will be implementing a system called video arraignment, through which inmates from jail can be interviewed remotely using cameras and Dante remote microphones and loudspeakers in a prison booth, saving time and reducing the costs and risks involved with prisoner transport. “The reception to the technology has been really, really good,” Cannon said. So good, in fact, that since completing the remaining criminal courtrooms, TCG has been in the process of replicating the integration in the city and county courtrooms as well. Now, for Lake County residents, jury duty can feel a little more like a role on a TV drama. Matt Pruznick is associate editor for SCN and Residential Systems.